The former leader of a US church that was widely known for its inflammatory anti-gay protests has died, his family has said. It claimed their deaths were punishment for America's tolerance of gay people. Their signs read "Thank God for dead soldiers" and "Thank God for 9/11" and the like, and bore messages offensive to gay and lesbian people. Born in Mississippi in 1929, Mr Phelps was raised a Methodist and was selected to attend the US Military Academy. 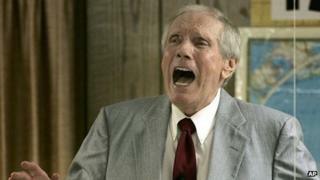 He was ordained a Baptist minister, though Westboro was not attached to any mainstream denomination. Mr Phelps earned a law degree from Washburn University in 1964, but was stripped of his licence to practise in Kansas in 1979. The Kansas Supreme Court said Mr Phelps made false statements in documents and "showed little regard" for professional ethics. Later, he and his small congregation - founded in 1955 and later dubbed "the most hated family in America" by the BBC's Louis Theroux - aimed their vitriol at many groups, including immigrants and Jews. But their signature slogan was "God hates fags". "You're not going to get nowhere with that slop that 'God loves you,'" Mr Phelps once told the Religion News Service. "That's a diabolical lie from hell without biblical warrant." In 2009, Mr Phelps and his daughter were barred from entering the United Kingdom due to their anti-gay preaching. The church's actions inspired a federal law and numerous state laws limiting picketing at funerals.